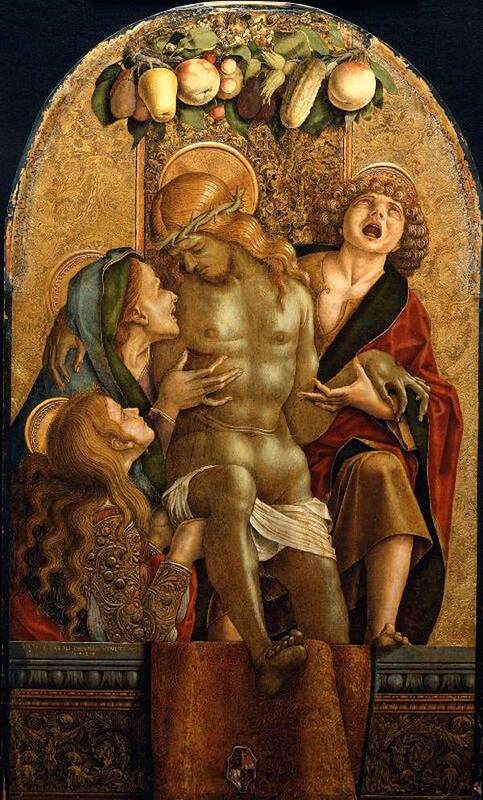 Carlo Crivelli (c 1435–1495), The Dead Christ with the Virgin, St John, and St Mary Magdalene (1485), on panel, 88.3 x 53 cm, Museum of Fine Arts, Boston, MA. Wikimedia Commons. Other than in still life painting, fruit and vegetables don’t get much coverage in art. Grapes, apples, pears and peaches pop up now and again, and there are always the extraordinary portraits of Giuseppe Arcimboldo (1526/7-1593). But the humble cucumber gets barely a mention in passing. Except in the exquisitely ornate works of the Renaissance painter Carlo Crivelli (c 1435-1495). No matter what his motif, Crivelli appears to have been obsessed with cucumbers. Carlo Crivelli (c 1435–1495), The Virgin and Child (c 1480), on panel, 37.8 x 25.4 cm, Metropolitan Museum of Art, New York, NY. Wikimedia Commons. 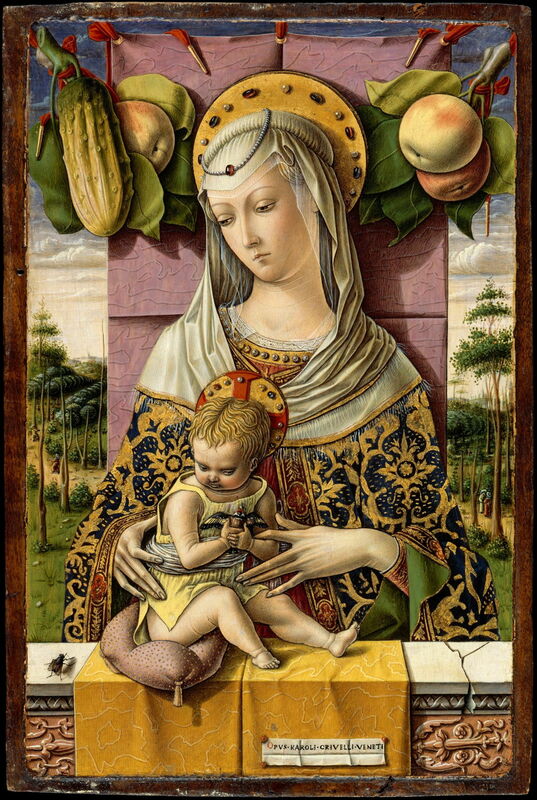 Cucumbers appear most frequently in the garlands of fruit and vegetables with which Crivelli decorates his many paintings of the Virgin and Child. 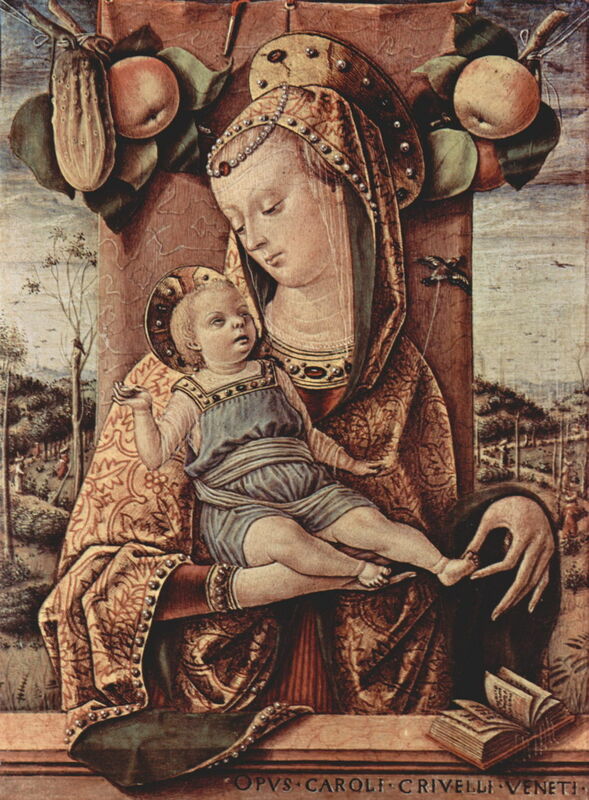 Carlo Crivelli (c 1435–1495), The Virgin and Child (1480-6), on panel, 21 x 15.5 cm, Pinacoteca Comunale Podesti, Ancona, Italy. Wikimedia Commons. They are consistently present even when he varies his iconography, as with the much later Madonna della Rondine, originally painted for the church of S Francesco dei Zoccolanti, Matelica, and now in London’s National Gallery. 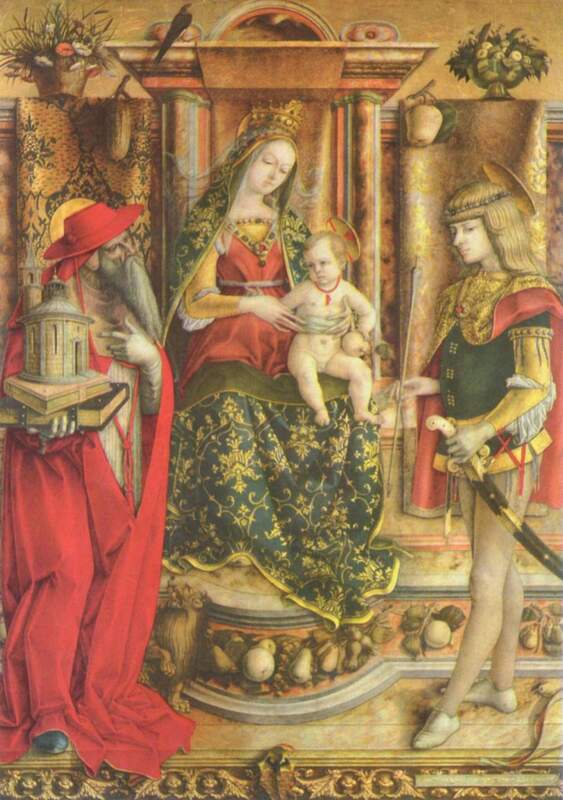 Carlo Crivelli (c 1435–1495), Madonna della Rondine, from S Francesco dei Zoccolanti, Matelica (after 1490), on panel, 150.5 x 107.3 cm, The National Gallery, London. Wikimedia Commons. Carlo Crivelli (c 1435–1495), Madonna della Rondine, from S Francesco dei Zoccolanti, Matelica (detail) (after 1490), on panel, 150.5 x 107.3 cm, The National Gallery, London. Wikimedia Commons. If they were to have any symbolic meaning, the only suggestion which has been made is that they are phallic symbols: hardly a likely explanation in these examples. Neither does Crivelli restrict them to his paintings of the Virgin: Mary Magdalene clearly needs their company too. Carlo Crivelli (c 1435–1495), Mary Magdalene (c 1480), on panel, 152 x 49 cm, Rijksmuseum, Amsterdam. Wikimedia Commons. Group the Virgin and Mary Magdalene with St John and the dead Christ, and here comes the cucumber again. They are not associated specifically with females: Crivelli adds them to his St James of the Marches. Carlo Crivelli (c 1435–1495), St James of the Marches (1477), on panel, 198 x 64 cm, Musée du Louvre, Paris. Wikimedia Commons. They also decorate single panels, and those incorporated into altarpiece polyptychs. In this triptych, we are treated to at least one cucumber in each of its panels. 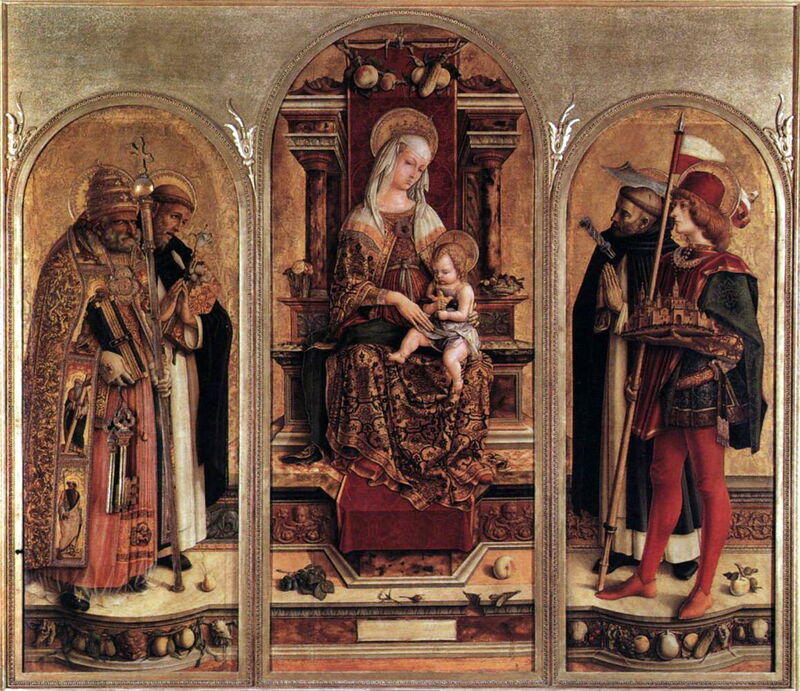 Carlo Crivelli (c 1435–1495), Triptych of Camerino, from the altarpiece for S Domenico (1482), on panel, 170 x 198 cm, Pinacoteca di Brera, Milan, Italy. Wikimedia Commons. Thomas Golsenne considers that they appear in almost all of Crivelli’s paintings, as a symbolic signature, although studying each one carefully enough to be confident would be no easy task. There seems no good reason for Crivelli to celebrate the humble cucumber in his paintings. The fruit/vegetable, from the gourd family, came to Europe from the Indian sub-continent long before the Greek and Roman civilisations, so they were hardly novel in the late 1400s. If you get a chance to visit a gallery – such as the National Gallery in London – with a number of Crivelli’s works, it may be worth counting how many cucumbers you can spot. I was a little disappointed that Paula Rego’s Crivelli’s Garden (1990-1), painted when she was resident at that gallery and was clearly enjoying being surrounded by Crivelli’s work, makes no mention of cucumbers. The last word, inevitably, should go to Crivelli himself, and his Last Supper, which shows the disciples eating – yes, cucumbers, of which there are at least two being held. There is no record even in the New Testament Apocrypha as to whether they were a ‘burpless’ variety. Carlo Crivelli (c 1435–1495), The Last Supper, from the altarpiece for S Domenico, Camerino (1482), on panel, 26.7 x 75.3 cm, Musée des Beaux-arts de Montréal, Montréal, Canada. Wikimedia Commons. Golsenne T (2015) Carlo Crivelli: Portrait of the Artist as a Cucumber, chapter in Campbell SJ ed. 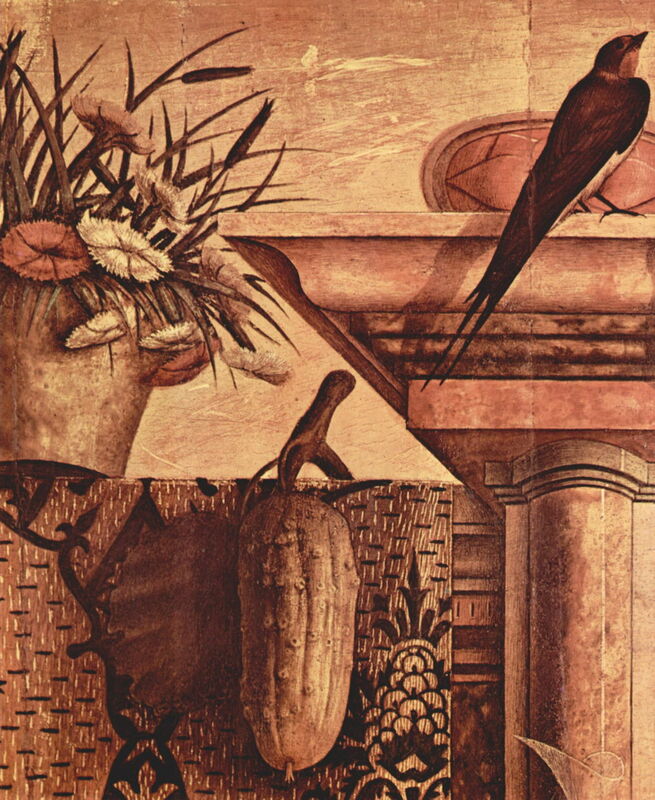 Ornament & Illusion, Carlo Crivelli of Venice, Paul Holberton. ISBN 978 1 907 37286 5. 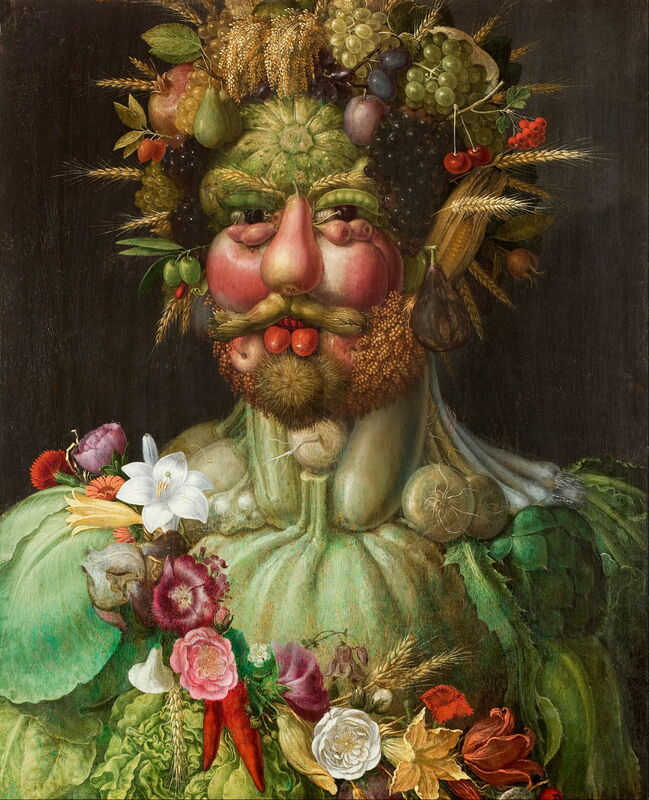 Posted in General, Life, Painting and tagged Arcimboldo, Crivelli, cucumbers, fruit, gourds, painting, vegetables. Bookmark the permalink.